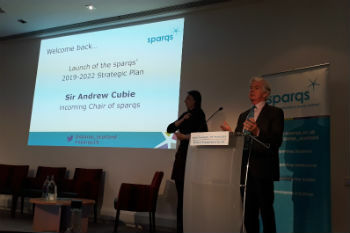 Our Strategic Plan 2019-22 was launched at the sparqs conference in March 2019 by Sir Andrew Cubie, our new Chair. The new plan continues much of the work in the previous plan, revised and refreshed to reflect the current needs of the sector. We strive to be innovative and responsive with our resources. Development of the 2019-22 plan and many other areas of our work involve students and other key stakeholders in the design and delivery process, to ensure that we continue to use our resources effectively. Students are partners in shaping the quality of learning, making positive change to their own and others’ experience, however and wherever they learn. Foster a culture of partnership between students and staff which enables the Scottish education sector to respond to challenges and realise its ambitions to provide the best possible experience for each and every student. Supporting students to develop the skills, approaches and expertise that enable them to be instrumental in enhancement activity and decision-making. Supporting institutions, sector agencies and decision-making bodies to embed effective and innovative practices that enable them to harness this student expertise. We will promote and develop these approaches nationally and internationally. Please view the Strategic Plan for further details of our work and direction until 2022.